Portsmouth, New Hampshire is a bustling coastal city that welcomes visitors in all four seasons. The town is known for its historical preservation, tax-free shopping, and incredible waterfront views, but it’s also being widely recognized for its eclectic food and beer scene. For a city of 21,000 people, it’s actually quite extraordinary how many restaurants are thriving in Portsmouth. With 22,000 seats available for dining, you could eat out three times a day for a month, and never visit the same place twice. My husband and I got the chance to explore Portsmouth last month, and that included checking out some of the most fabulous restaurants in the Seacoast Region. 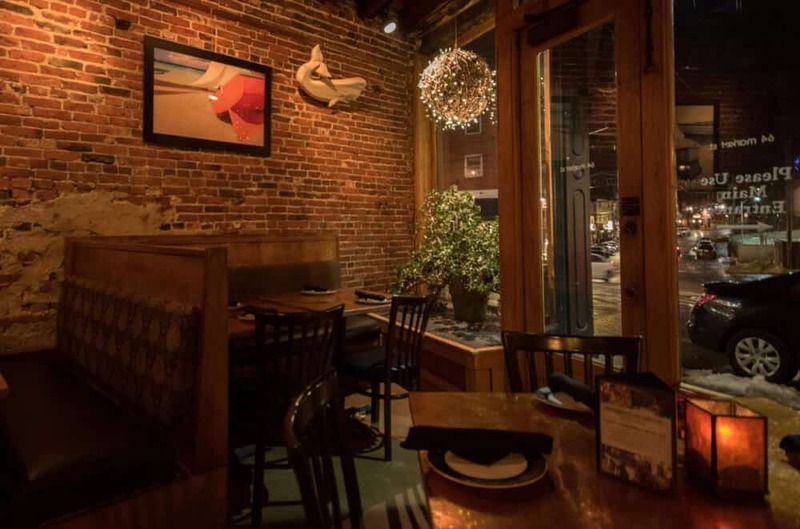 Here are some of our favorite Portsmouth, NH restaurants, as well as an overview of the best bed in breakfast in the region. Portsmouth is definitely known for its fresh-off-the-boat seafood and waterfront dining, and while it was tempting to stay downtown for all of our culinary adventures, we are so glad that we explored further afield. Our very first tip to you is this: don’t be afraid to get out of town. Some of our favorite meals were experienced away from the bustle of downtown Portsmouth, but still within a very reasonable driving distance. From the outside, Mr. Mac’s Mac and Cheese is pretty unassuming, and you’d be forgiven for thinking it’s just another kid-inspired greasy spoon. But we urge you not to pass this one by, especially if you’re still searching for comfort food that compares to Grandma’s. A clean and bright dining area greets patrons to Mr. Mac’s, which is located on Lafayette Road, just outside of downtown Portsmouth. While all the options are fantastically cheesy, you’ve got a huge variety of choices, from the all-American classic to shrimp scampi mac and cheese and chicken cordon bleu. Each day, cheeses are shredded, the roux is prepared fresh, and other ingredients are chopped and prepped for the day’s menu. We ordered in and sampled small skillets of pesto mac and cheese, pulled pork BBQ mac and cheese with a BBQ chip crumble topping, shrimp scampi mac and cheese, and garden veggie mac and cheese. All were delicious and rich renditions of an American classic. In addition to the standard single-serve meals, you can also purchase mac and cheese for a crowd. Deliciously dangerous! Downtown Gathering Spot: Portsmouth Gas Light Co.
As one of Portsmouth’s most popular restaurants, the Gas Light offers coastal flavors as well as farm-to-table eats in a pub-style atmosphere. Lots of high-end craft beers and cocktails are available every day of the week, and Monday’s half-price margaritas made a rainy and cold evening way more enjoyable. It was obvious that many of the other diners felt the same way — the place was hoppin,’ and the drinks were definitely flowing. We ordered salads to take the edge off of our margaritas – both were very fresh and loaded with goodies like goat cheese, herbs, sunflower seeds, and roasted beets. Other inspiring menu items include Maker’s Mark steak tips, beer-battered fish and chips, and incredible wood-fired pizza. Whether you’re a local or a visitor from afar, the Gas Light is definitely one of Portsmouth’s most inspiring gathering spots. As a relative newcomer to Portsmouth, Tuscan Kitchen is another restaurant that you might be tempted to drive past. It’s located on Lafayette Road, and while its location surrounded by strip-mall shopping may not be inspiring, the food more than makes up for it. In fact, our lunch at Tuscan Kitchen ranks high on my favorite-meal-ever list – it’s in the top 10. We had no idea what we were in for when we popped in for lunch on a Tuesday afternoon. Every single thing on the menu is made from scratch. Everything. The meat is smoked in-house (you have to try the salumi and prosciutto), artisan bread is baked fresh every day (delightful), and the pasta… don’t even get me started. My absolute favorite dish was the roasted butternut squash cappellacci. 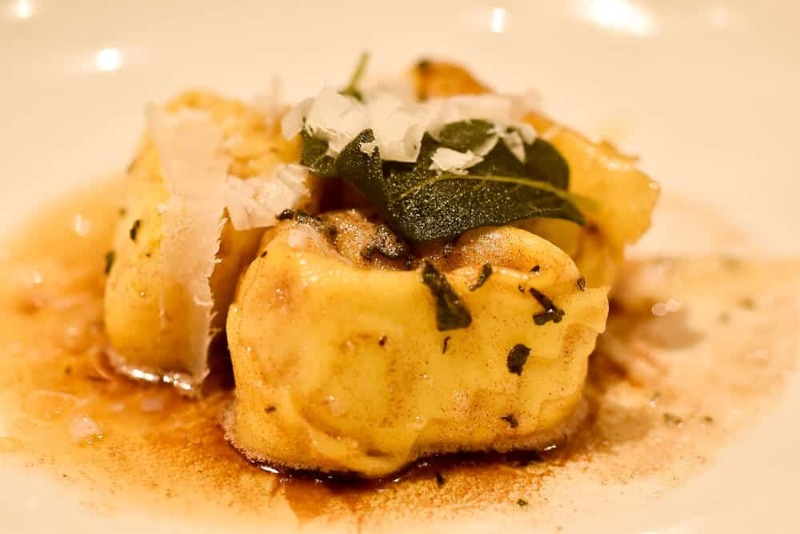 a savory-sweet mix of butternut squash, Parmesan cheese, and sage, wrapped in little sheets of homemade pasta, and drizzled with browned butter. You’ll be totally satiated by the time you look at the dessert menu, but if even you can’t eat another bite, please take some tiramisu for later. It’s is the perfect combination of light and rich, creamy and sweet, and of course, it’s kissed with the delicate flavors of chocolate, coffee, and liqueur. Just thinking about our Tuscan Kitchen meal has me ready to drive back to Portsmouth. Please don’t pass up a chance to indulge in this incredible Italian cuisine. Looking for stellar coffee and a wholesome breakfast right in downtown Portsmouth? 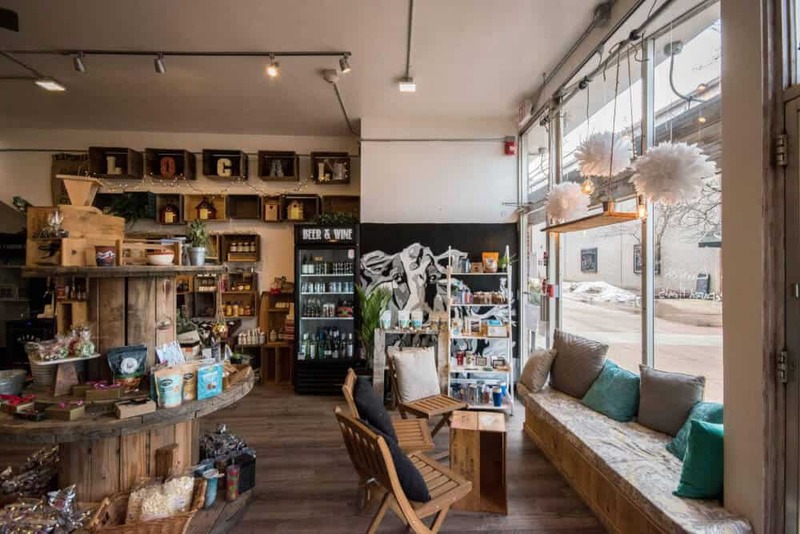 You probably have several choices, but our favorite spot is The Goods Market, located at 29 Vaughan Mall. It’s walking distance from all of downtown, and even from our amazing Portsmouth Bed and Breakfast, which was actually over the bridge in Maine. If you want to drive, it’s a stone’s throw from a great public parking lot, and the inside is unbelievably cute and welcoming. The Goods’ specialty is the Cali Wrap, which we couldn’t resist – scrambled eggs, roasted veggies, goat cheese, avocado, and sriracha. They also make a mean smoothie (I loved the Pink Passion), and if you’re heading out to the coast for a picnic, be sure to order one of their amazing subs to-go. In addition to the freshly-prepared meals, you’ll also find made-from-scratch chocolate, and locally-crafted gifts and treasures. The Portsmouth area has been a hub for the brewing industry ever since Frank Jones began brewing ale in 1858. By 1882, The Frank Jones Brewery was the largest in the country, producing 250,000 barrels of beer annually. Today, there are dozens of breweries in Portsmouth and the Seacoast, but one stands out, both for its innovation and it’s fabulous brews. Woman-owned and operated, Throwback Brewery prides itself on its thoroughly local creations, for both food and beer. Beer selections are as unique as they come and include a range of traditional brews and fun selections like the El ChuBREWcabra — a porter brewed with local peppers and cinnamon sticks, and the Fat Alberta Chocolate Peanut Butter Stout, which is only available in December and brewed with cocoa husks and peanuts. The brewery is located on a working farm and is home to sprawling gardens, as well as three goats, a handful of chickens, and two miniature donkeys. It’s a beautiful plot of land, and visitors are encouraged to visit the animals, relax outside with their kids, play lawn games, and enjoy an eclectic selection of farm-to-table meals. From snacks to sandwiches, and even a kids’ menu, Throwback has you covered, and if you just can’t get enough of the tasty beers, you can fill a growler or purchase cans from the cooler. Throwback Brewery is an award-winning gem of a place that you definitely won’t want to miss. 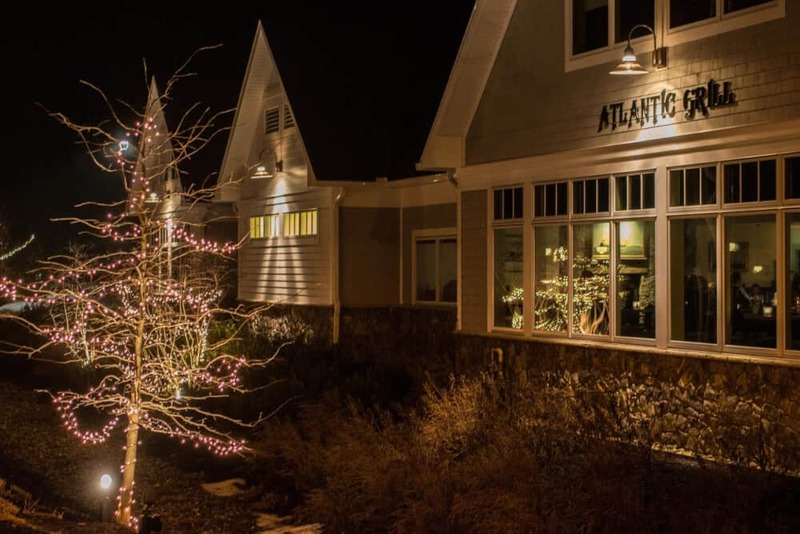 This swanky seafood restaurant is actually located in Rye, New Hampshire, so if you find yourself hiking around Odiorne Point State Park or checking out the critters at the Seacoast Science Center, you may want to stop into the Atlantic Grill for some of the most incredible seafood around. Before you take your seat, say hello to the jellyfish who love to welcome visitors from their day-glo home. We were lucky to score a fabulous spot near the cozy fireplace, even though the place was bustling. The four-sided bar was a hub of activity, and just about every table was full. We started off with a sampling of oysters, all from different locales, and all delicious. It was fun to read the descriptions of each oyster, and amazing that each one tasted so distinctly different from the next. As for entrees, there are a lot of seafood selections to choose from, and if you have trouble deciding, just ask your server for advice. We went with the grilled salmon and the Cantonese stir fry, because, truth be told, I judge a restaurant by its vegetarian options. If they can get tofu right, I’m a fan for life! The salmon came with a side of sweet potato hash and fried Brussels sprouts, which complemented the fish beautifully. We have since made a vow to make fried Brussels sprouts at home. We can’t stop thinking about them. The stir fry did not disappoint, and it was definitely not a vegetarian afterthought. The tofu and veggies were crispy and fresh, the sauce sweet, sour, and spicy. I can’t wait to go back, because we really didn’t have room for dessert. Let me start by saying that the headline is a bit off — we actually stayed just over the Piscataqua River in Kittery, Maine, but our lodging was within walking distance of downtown Portsmouth, and it was perfect! The Portsmouth Harbor Inn & Spa is a Victorian bed and breakfast featuring five uniquely decorated rooms, a lively innkeeper, and the best blueberry pancakes ever. Lynn has been running the inn for many years, and it’s obvious that she enjoys hosting the guests that pass through. She bakes fresh chocolate cookies each afternoon, is always available to share stories or advice and is happy to disappear if privacy is important to you. We visited in the off season, and had the pick of second-floor rooms. We chose Minx because of its lovely view, and bright, airy feel. All of the rooms are furnished with a queen or king-sized bed and have a full bathroom, though, and you really can’t go wrong with any of them. The downstairs common area includes a large table for dining and a small sitting area. A side table holds a selection of lovely teas that you can make yourself (to have with those fabulous chocolate chip cookies), or you can indulge a bit with a glass of port or sherry, along with some dark chocolates for snacking. We didn’t spend a lot of time downstairs, mainly because we were so busy exploring, but we did have our morning coffee in the sitting area before breakfast. The breakfast at the Portsmouth Inn & Spa was definitely something to write home about (or post on Instagram). After a walk across the Memorial Bridge to watch the sunrise, we returned to the inn for fresh-brewed coffee and our first breakfast course – baked apples in a cider reduction with walnut pieces and fresh whipped cream. These delights were followed by Lynn’s famous blueberry pancakes, which were wonderfully light, loaded with tiny Maine blueberries, and drizzled with real Maine maple syrup. It was such a treat! The Portsmouth Harbor Inn & Spa will delight you with its old-world charm, convenient location, and cozy rooms, especially if you’re looking for something more unique than a standard hotel room. I hope we’ll have many opportunities to return. There are lots of places to eat, drink, and sleep in Portsmouth, NH, but so far, these are our favorites. If you have any of your own, please share them with us. Want to read more about visiting Portsmouth, New Hampshire? Check out our post about the best things to do on a winter getaway in Portsmouth. And if you want help planning your trip, not to mention ideas for dining, lodging, and shopping, definitely check out the Chamber Collaborative of Greater Portsmouth. Please note: We were generously hosted by the Chamber Collaborative of Greater Portsmouth so that we could research and write this post. As always, our opinions are entirely our own. Everything looks so cozy! 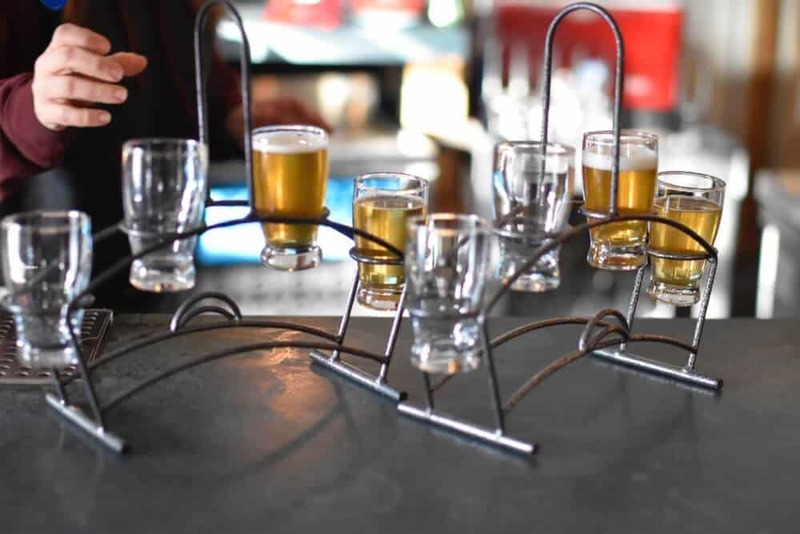 I’d especially love to try a flight at the Throwback Brewery and to have a steaming cup of coffee on a cold day at the Goods Market. Great tips here. You had me at mac and cheese, yummm!! I have yet to visit New Hampshire but Portsmouth looks lovely. I just love that dining room, what a beautiful place to stay. Mr. Mac’s Mac and Cheese looks to die for!!!!! Totally not a good idea to be seeing your photo late at night. I’ve honestly never thought to visit New Hampshire, but I’m definitely adding it to my bucket list now! Ah, the Throwback Brewery is highlighted almost immediately to me :). I’m also drawn to anything Italian so the Tuscan Kitchen would also be somewhere we would love to eat. I agree with your tip about getting out of town. Sometimes these are where the really great places are. The donkey is also super cute! The Throwback Brewery sounds amazing. I am not a big fan of beer, but for sure I am a big fan of animals. So I would love to enjoy some farm-to-table meals and play with a couple of the animals there. The Goods Market looks 100% my cup of tea! Love how much eating you did on your trip – a traveller after my own heart!! What a brilliant place! It sounds absolutely packed with great options, and I could definitely imagine rolling in for a leisurely breakfast, maybe lingering for lunch, and who could resist dinner… (Better get to the gym first!) I love the thought of a brewery with donkeys too – that’d be both my partner and I truly happy in one visit. Thanks for the comment, Bernie. Luckily, Portsmouth is a very walkable city, so if you do a lot of exploring, you’ll burn the calories before your next meal. The Goods Market and Gas Light really stand out to me in terms of decor and food I can eat with my allergies (though who doesn’t want to visit with a donkey!?). Restaurant suggestions are so helpful when visiting a new place. So often, I find myself eating boring food when a great place is right next door.